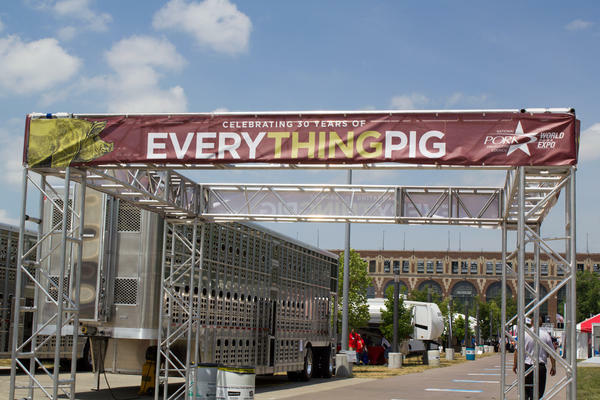 The 2019 World Pork Expo has been canceled. This photo is from the 2018 event in Des Moines, Iowa. African swine fever has been spreading through China since August, and also is present in Europe and its namesake continent. The National Pork Producers Council, which hosts the annual event in Des Moines, announced this week it would not be held this year because of the threat of a U.S. outbreak. It would be costly to the nation’s pork industry because export markets that farmers depend on would immediately close and many pigs would die. However, Jim Monroe, spokesperson for the National Pork Producers Council, said it’s not likely the virus would arrive because of people at the World Pork Expo. Typically, 20,000 people from 40 countries visit Des Moines for the expo, which was supposed to be held June 5-7 this year. Trina Flack with Catch Des Moines, the Greater Des Moines Convention and Visitors Bureau, said the city’s tourism industry will lose about about $6.3 million this year. Flack added that a swine show that’s held at the same time will still go on and the 2020 World Pork Expo is expected to be held as planned. African swine fever has been found in Vietnam and South Africa and is now in nearly every region of mainland China. It’s also in Romania, Russia and Belgium, among other European countries. It is not present in North America. This story has been corrected to show that Flack works with Catch Des Moines, not the Greater Des Moines Partnership.